Whether for legal reasons or as part of a larger effort to reduce storage costs, some companies want to maintain Enterprise Vault data that corresponds only to the shortcuts in a user’s mailbox. It is possible that not every item within an Enterprise Vault mailbox archive has a corresponding shortcut in the mailbox. Deleted shortcuts account for the orphaned items. In other words, items that the user can no longer access from their mailbox. Orphaned Items Processing runs as a service on Enterprise Vault mailbox archiving servers, versions 8 - 12. It correlates shortcuts in the mailbox to their items in the mailbox archive. It then processes the archived items assigning those that do not have a corresponding shortcut the retention category of Orphaned Items. You define the retention period. They will now appear in Archive Explorer in a new Orphaned Items folder with their new retention category, giving users the ability to review and potentially restore these items before they expire. 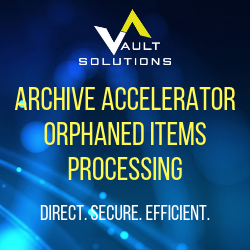 This solution is backed by a powerful reporting engine that charts the number of items in the Enterprise Vault mailbox archives and the percentage orphaned. It can also be run in report-only mode to identify archived items having the potential of being tagged as orphaned without modifying the retention category. With GDPR, it’s important that orphaned items not linger in your archives. It is now more critical than ever to make sure you don’t have unwanted data contributing to your ROT. In case you missed it, we talk a bit more about ROT and how to get rid of it here.